This lightweight tripod is great for photographers who are looking for a lightweight and versatile 56″ Tripod.With the ability to position your camera from a normal landscape orientation to a portrait orientation,you are sure to be able to capture the photo you want. 1/4″ Quick-Release Plate: Now you’re able to attach and detach your camera in seconds with the tripod’s quick-release mounting plate.It makes possible fast transitions between shots and quickly moving from spot to spot. 3-Way Head: This compact tripod comes with an updated three-way photo head which is ideal for precise framing.Let Full panoramic becomes more easier with its 360-degree swivel function.Changing the orientation of the camera from portrait to landscape will never be an issue again. 4-Section Lever-Lock Legs: With the four-section lever-lock legs your lightweight tripod can effortlessly accommodates custom set-ups in uneven terrain when you needed to frame the shot just so.The Center is gear driven to extend,and rubber feets ensure the stability on different surfaces. 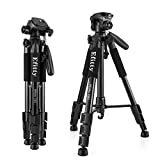 Lightweight and Easy to Store: Thanks to the strong yet lightweight material,you can carry this tripod from one location to another effortlessly.The tripod fits perfectly into the provided carrying bag for safe storage. 1/4″ Quick release plate allows you to attach and detach your camera in seconds. Measures 20 inches (collapsed); extends up to 56 inches. weight hanging hook,plate buckle joint. 360 degree elastic knob,Non-slip MATS.Portrait or landscape options. Comes with a portable zippered bag,easy to carry. This entry was posted in Discount Photography and tagged 3Way, 4Section, Ball, Black, Camera, Cameras, Canon, Capacity, Degree, Digital, DSLR, Flexible, Head, inch, Lacaca, Legs, LeverLock, Lightweight, Load, Monopod, Nikon, Plate, Portable, QuickRelease, Sony, Travel, Tripod by Ball Photo. Bookmark the permalink.